Update …. Riley’s EBV was rechecked on Monday. He has gone from 372,000 back down to 176,000. After consulting with Oncology the team is comfortable in waiting to do a PTLD work up. The thought being he will eventually need to have the CT scan done and since his numbers are trending back down they rather wait. That being said .. When Riley has his pretesting in a few weeks we will check his EBV again. If it is elevated .. We start the whole PTLD conversation again. There really is no good answer. Children have been Dx with PTLD with copies at 110,000 and children have had number over a million and not been dx with PTLD. I have an update on Riley’s labs. Rather then trying to repeat it .. I’m going to copy part of the email. Riley’s EBV from yesterday was pretty elevated. It was up to 372,524 (up from 22,000 on 1/13/14). I spoke with Dr. Goldfarb, Dr. Kreindler and Dr. Lin following these results. The plan is going to be to repeat the lab in one week. This will need to be done at a CHOP facility. Since Riley is having this change in stools with the foul smell and change in color, there is a chance that if he has another process going on such as a GI virus or other causative agent, this could cause the EBV number to be elevated. Another reason that we would like to wait another week is because everyone agrees that his exam is extremely reassuring and he does not have any symptoms that would outwardly indicate PTLD. If the number is still elevated, we will most likely proceed towards doing a CT scan to evaluate Riley further. Depending on timing, this could be something that we could try to coordinate with the dental procedure, as previously discussed. Riley’s tacrolimus level this morning was a little low, 6.5. We will also repeat this level next week when you come for labs. Riley had appointments on Monday with both cardiology and pulmonary. First we saw Dr Lin. She was very Happy with Riley’s echo and the labs that had come back. She is still trying to find a way to get dentistry in when Riley has his Cath/Bronch in March. We know Dr Rome won’t allow any work done in the Cath lab but maybe some imagery and get the dentist in there to take a look. There is no way at this time with Riley’s PTSD that he would sit willingly for dentistry. Before leaving cardiology Dr Hanna came to visit. Riley really misses seeing him when we’re there. Dr Hanna is always just silly with Riley. Today was no exception. Silly as always but he didn’t examine him .. he just played. Making it an ever better visit for Riley. Dr Hanna has already begun saying that next summer Riley is coming to camp with him. The thought of Riley being away for a week blows my mind but it’s also something we’ve kinda been working towards. Riley getting old enough and healthy enough to go to Camp Dragonfly. After our morning with cardiology .. We spent the afternoon with pulmonary. Dr Kreindler is also very Happy with Riley. Even lower his steroids a little. We discussed Riley’s Cath/Bronch as we had with Dr Lin and the thought is to admit Riley overnight after like we use to. For one because of it being the 1yr Cath/Bronch and it’s a little more involved then the previous as far as some of the testing that is done. Also because of the reactions that Riley has had after more then 2 dozen caths. We have always treated it as a contrast allergy but Riley didn’t have contrast during his last procedure. So now the thought is leaning more towards Anesthesia. Dr Kreindler is going to talk to Dr Javia (ENT) about closing up Riley’s stoma in his neck. Kinda for quality of life reasons. We would like to get Riley to the beach this summer and for him to be able to run free. Not worrying about splashing sand or water. Dr Kreindler also mentioned getting Riley’s hearing checked. This seemed a little out of left field but he said being on Lasix for as long as Riley has .. which is his whole life .. It can cause hearing damage. Wow. Never heard that before. Not that it would have changed anything. Riley has never been in a position to not be on Lasix. Although after his Cath/Bronch .. if his BNP is still stable and low .. Riley may get off of Lasix for the first time .. ever. So overall it was a good visit. We’re still waiting on his Tac level and EBV. 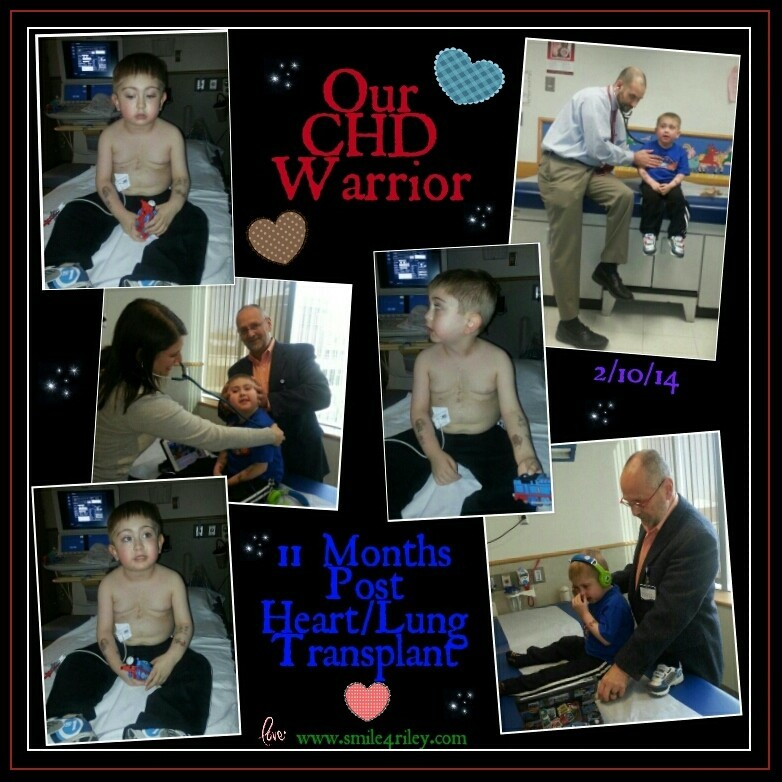 Hopefully they are in check and Riley can roll smoothly into being One Year Post Heart/Lung Transplant! Hard to even imagine yet it’s right around the corner. I will update when we know the lab results and about the other decisions still being made about his procedure March 5th.